Happy Monday! 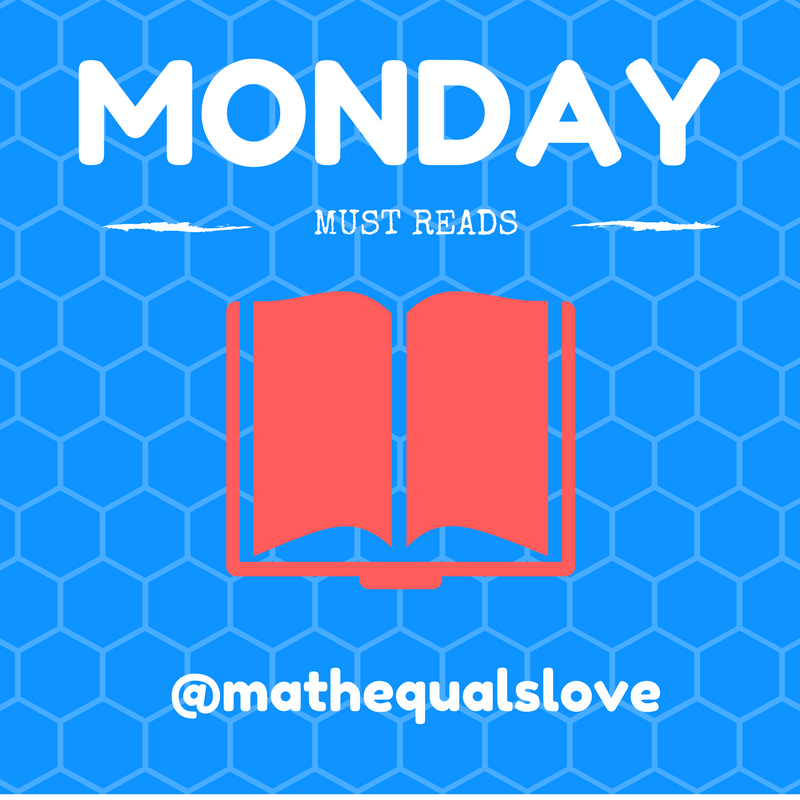 It's time again for a new volume of Monday Must Reads. I'm extra thankful for having a relaxing weekend with no workshop presentations to give! Speaking of workshop presentations, I need to start trying to turn my presentation into a series of blog posts. 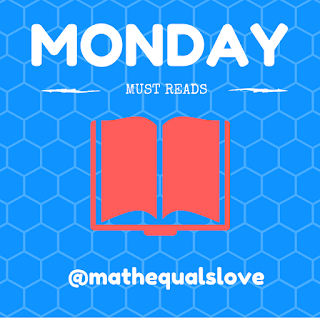 Here are the "must-read" ideas I ran across this week on twitter and in my RSS feed! Working on radicals with your students? Check out this great problem that Hannah found and shared on twitter! To the best of my knowledge, the problem was originally created by Jason Steele. 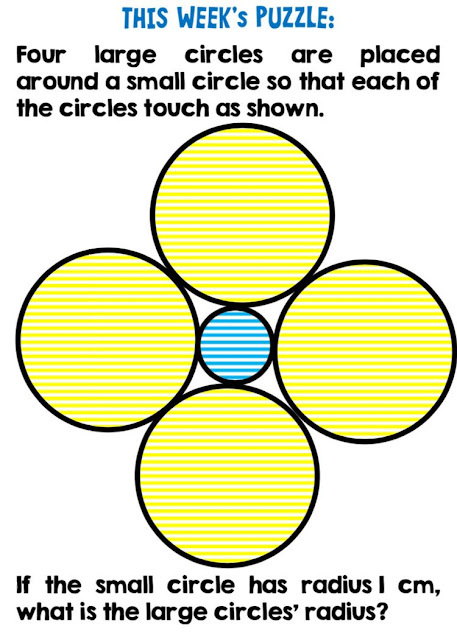 Chris Smith has featured a great geometry puzzle in his weekly newsletter. If you haven't signed up for this bit of brilliance that arrives in your inbox once a week, you need to do so now! You can sign up for free by sending Chris an email at aap03102(at)gmail(dot)com. Need further proof that Chris Smith is amazing? Check out this awesome fact about February! David Wees shares a great image to spark conversations about connecting representations in math. I see so much potential for using this in my classroom! Here's another great task from David Wees. Exponent rules are such a tricky thing to teach. I especially like this approach from Kristin McNair where students are given answers and have to determine if they are true or false. Geometric probability has never been my favorite topic to teach, but Mrs. Palker's approach to this topic with nerf guns makes it sound like a fun topic to teach! Mrs. Helms shares a great idea for practicing identifying like terms: a card sort. I've played games before to practice this, but I think my students would benefit from doing a card sort BEFORE playing the game. I could even use the same cards for the sort and the game! Randy Miller shares some great quotes of how people use algebra in their day-to-day lives. I'd love to do something similar and collect quotes from people in our community! Clarissa Grandi shares some great Valentine's day projects to bring a little more creative, artsy math into your classroom! Check out Clarissa's beautiful, inspiring blog here. Tony M shared a great card sort activity from ATM Mathematics, and it has got me thinking about how I want to approach our upcoming unit on systems of equations. Instead of just giving students a system of equations to solve, I can give them cards with pieces of information that can be COMBINED to allow them to solve the problems. I've been on the lookout lately for ways to make students more responsible for their own learning. I was very excited to come across this idea from Mrs PB. I need to find ways to have students reflect on their own work BEFORE they turn it in. I see potential for using this in math class! Elissa Miller shares a great color-sorting task for parallel and perpendicular lines. I especially like the fact that different representations of lines are used instead of solely using equations like I've done in the past. I love seeing the great, hands-on activities that Shaun Carter comes up with for his geometry classes. 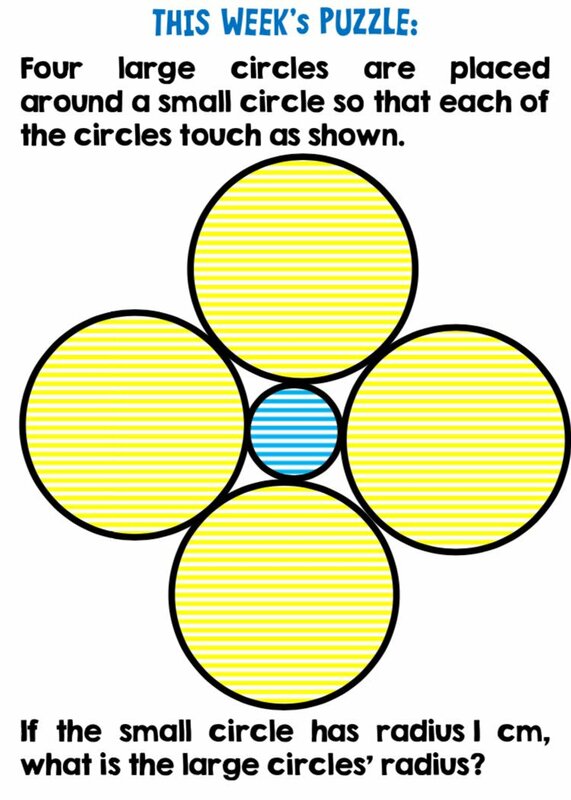 This area of a circle task is no exception. Check out Shaun's blog to find more details and free printables here. Shaun Carter further inspires with a great example of color with a purpose in regards to analyzing the graphs of polynomials. You can find the download for this file on Shaun's blog here. I am definitely a chocolate lover. So, when I saw that S. Leigh Nataro combined chocolate kisses with confidence intervals, I knew I had to file this idea away for the next time I teach stats! Check out her blog post here. I love this beautiful fractal display from Kate Mitchell. What cooler way to celebrate the winner of a roller coaster design challenge than 3D printed trophies?!? What a great idea from Steve Maier! I love using WODB (Which one doesn't belong?) in my classroom. Miss Arndt combined cookie sheets, pattern blocks, and tape to give students a chance to create their own! How would your students fare if you posed the same question to your class as Mr. Dyck? I'm sure most of you are already familiar with the Tower of Hanoi puzzle. But, have you ever thought of it in terms of the time required to solve the puzzle? Thanks to TeatherBoard for sharing this photo which has got my mind working up some ideas for using this in my classroom! Gina Ging shares a brilliant idea for using dice in dice (affiliate link) to make an engaging distributive property activity. I love how the inner die determines the sign of the number displayed on the outer die. Julie Morgan has got my mind working overtime with ideas of how to adapt this question structure for my Algebra 1 classes. I was excited to run across some great puzzles on twitter from Gareth Ffowc Roberts. How many of these diagrams can you trace without ever raising your pencil or going over the same line twice? Paul Jorgens' Forgotten Polynomial task will definitely be making an appearance in my polynomials unit! Here's another great polynomial task from Paul Jorgens. My favorite activity shared by Paul this week, though, is this "Fastest Fingers" task to motivate the zero product property. This is pure brilliance. If you aren't using patty paper in your classroom, you are missing out. Amber Longhi shares an idea for using patty paper to demonstrate functions and their inverses. Madi Roberts took my Function Auction lesson to the next level by putting her own face on the money! Want to incorporate the Super Bowl into your class? Check out this WODB (Which One Doesn't Belong?) activity from Parmenter Math. Louis Lantiere combines a composite area problem with an open middle problem, and the result is awesome! Mr. Brad Evans shares a fun, fraction challenge: how many different ways can you show 1/4? Lisa Eischens inspires with some amazing mathematical bulletin boards! I've never taught calculus, but this visual from Nicole Lalanne is brilliant. I'll never think about the Mean Value Theorem the same way every again! Jenise Sexton has convinced me that I need a tombstone in my classroom. Check out Jenise's post here for more details. Coach Fred is also fighting against "I don't know." Charlotte Anne shares an assessment idea that has me intrigued. 2/3 of their test grade is determined by a traditional test. The other 1/3 is determined by a hands-on activity that is completed with a partner. I've been working hard to get my chemistry students to wrap their minds around just how tiny an atom is and how tiny the nucleus is in regards to the entire atom. I love this visual from Andy. Now, I just need to modify it to center over Oklahoma to give my students a better idea of how big it is! I'm fully convinced that Jennifer Abel gives her geometry students the most interesting projects. Check out these golden ratio projects. Elyssa Stoddard knows how to inject some healthy competition into math class by having an integral drawing competition. I can SO see myself doing this with squiggly brackets in Algebra 1! Julia Anker shares a tiny lesson tweak that could make all the difference with your students. I've always struggled to understand how to write numbers in other bases. I think seeing something like this "Flippy Do" from WSD STEAM Students to explain binary would help me understand binary! Mr Etheridge shares an awesome task to use when studying area. Do your students need practice adding/subtracting radicals (surds)? Check out this magic square task from Mr Knowles. Marcus Wong shares a great task involving analyzing coordinates. This could be easily adapted to focusing on graphing in all four quadrants. Mrs. Donavan offers an example of a structure that can be applied to so many different math topics. What is the SAME? What is DIFFERENT? I realize the Super Bowl will be over by the time you read this, but I can't leave out this awesome Super Bowl themed task from Leslie Lewis. Lisa Richardson has shared some awesome factoring activities on her blog that you must check out! Jade White shares a great idea for using sticky notes to allow students to correct their mistakes without erasing their previous work. Brilliant! Benjamin Dickman shares an awesome puzzle that will definitely be making an appearance on my puzzle table! I particularly like Louis Lantiere's area task, though it's perhaps a bit too complex for me: with a slightly simpler task it might be easier to avoid trial and error.